France and Croatia will fight for the greatest prize of all in Moscow on Sunday. Les Blues, of course, are odds on favourites! Fancy Deschamps' men to win in 90 mins? Get a tasty 40/1 France to beat Croatia at Betfair + £100 in free bets! Deschamps' men reached the World Cup final by beating Belgium 1-0 in the semifinals, courtesy of a Samuel Umtiti header. They have also beaten Argentina (4-3) and Uruguay (2-0) in the knockout stage. In the group stage, France beat Australia (2-1) and Peru (1-0), and recorded a goalless draw against Denmark (0-0). As a result, they have kept 4 clean sheet in 6 games. If you fancy France to beat Croatia, don't miss this 40/1 price boost at Betfair Sportsbook! Normal price is around 9/10! Get 40/1 France to beat Croatia with Betfair! New Customers can get France at an enhanced 40/1 to beat Croatia. Max Stake £1. Winnings paid in free bets, valid for 7 days, only deposits with cards/Paypal count. Exchange and multiple bets excluded. T&C’s Apply. 18+|Gamble Aware. Register a new account with Betfair before the kick-off and claim 40/1 France to win the 2018 World Cup Final against Croatia - An unmissable promotion!! If France win in 90 minutes, Betfair will pay out at the quoted price immediately. They will top up your additional winnings within 24hrs. France overcame Argentina, Uruguay and Belgium en route to the final, so they have already seen off some stern challenges. Didier Deschamps' men have kept four clean sheets in 6 World Cup matches so far. Croatia have played an extra 90 minutes in the knock-out phase alone with all three ties going to extra-time. With one day less to recover from the semis, surely that has to tell. Croatia have never beaten France in their five previous meetings, losing three including a World Cup semifinal 20 years ago. France are the clear favourites to win the World Cup at 9/10, so this 40/1 price boost is a massive bargain! 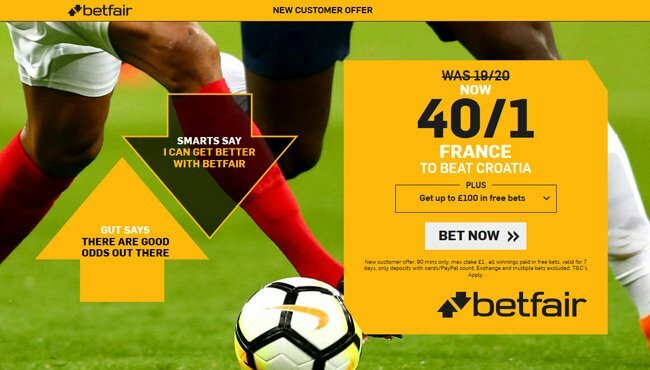 Betfair are giving all BetAndSkill readers opening their account via this page the chance to back 40/1 France to beat Croatia in 90 minutes, click here to get your massive boost in less than two minutes! The price boost offer is only available to new Betfair customers, aged 18 or above, based in the United Kingdom or Ireland. Max. bet on enhanced odds is €/£1. Standard winnings are paid in cash based on normal odds as advertised on Betfair. Payment restrictions apply. Eg.Moneybookers, Paysafe, Neteller and Skrill deposits do not count. "40/1 France to beat Croatia at Betfair (World Cup Final Boost)"